Do you know where your grandparents are? Has the Little Big Shots: Forever Young TV show been cancelled or renewed for a second season on NBC? The television vulture is watching all the latest cancellation and renewal news, so this page is the place to track the status of Little Big Shots: Forever Young season two. Bookmark it, or subscribe for the latest updates. Remember, the television vulture is watching your shows. Are you? 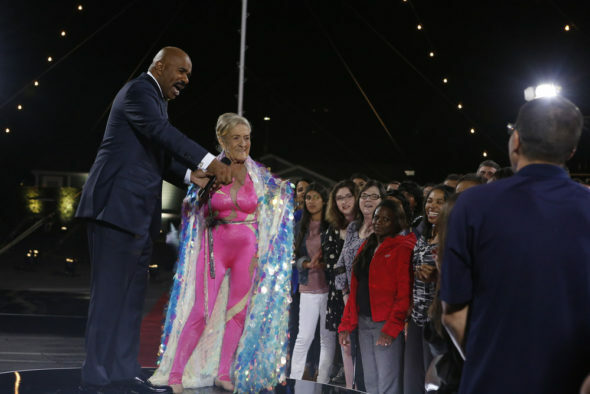 A spin-off of the Little Big Shots TV show, airing on the NBC television network, Little Big Shots: Forever Young is a comedy variety series from Ellen DeGeneres and Steve Harvey. The series showcases young-at-heart seniors with hidden talents, sparkling personalities, and the wisdom only born of experience. As host, Harvey interviews musicians, singers, dancers, and other talented senior citizens between ages 60 and 103 years old, who also perform on the series. Some are athletic, some are particularly notable in their fields, some are dancers, singers, musicians, magicians, or social media sensations. All of them, though, are forever young. The the first season of Little Big Shots: Forever Young is averaging a 0.92 rating in the 18-49 demographic and 6.40 million viewers. Find out how Little Big Shots: Forever Young stacks up against other NBC TV shows. As of April 24, 2019, Little Big Shots: Forever Young has not been cancelled or renewed for a second season. Stay tuned for further updates. Right now, it is too early to assess the ratings, to see if Little Big Shots: Forever Young will be cancelled or renewed for season two on NBC. Flying blind though, I think a second season is more likely than not. I’ll keep an eye on the Nielsens and update this page with any developments. Subscribe for free updates on any Little Big Shots: Forever Young cancellation or renewal news. Find more Little Big Shots: Forever Young TV series news or other NBC TV show news. What do you think? Do you hope Little Big Shots: Forever Young will be renewed for a second season? How would you feel if NBC cancelled this TV series, instead? More about: Little Big Shots: Forever Young, Little Big Shots: Forever Young: canceled or renewed?, Little Big Shots: Forever Young: ratings, NBC TV shows: canceled or renewed? Tell them to bring back “Better late than never”! Little Big Shots is a totally unique and refreshing series at a time when we need more levity in our lives. Bravo to the producers and network for giving us a much-needed relief from ill conceived and feeble attempts at entertaining TV viewers. This show complements the likes of Candid Camera and Art Linkletter’s offerings with kids. Thank you to NBC and the show’s producers. Cancel these two shows. I’m a senior citizen and I think this show stinks… it’s just awful… not to mention yet another idiotic show for Steve Harvey…. is he really the only possible host for anything these days? Can’t stomach him, or Ellen.